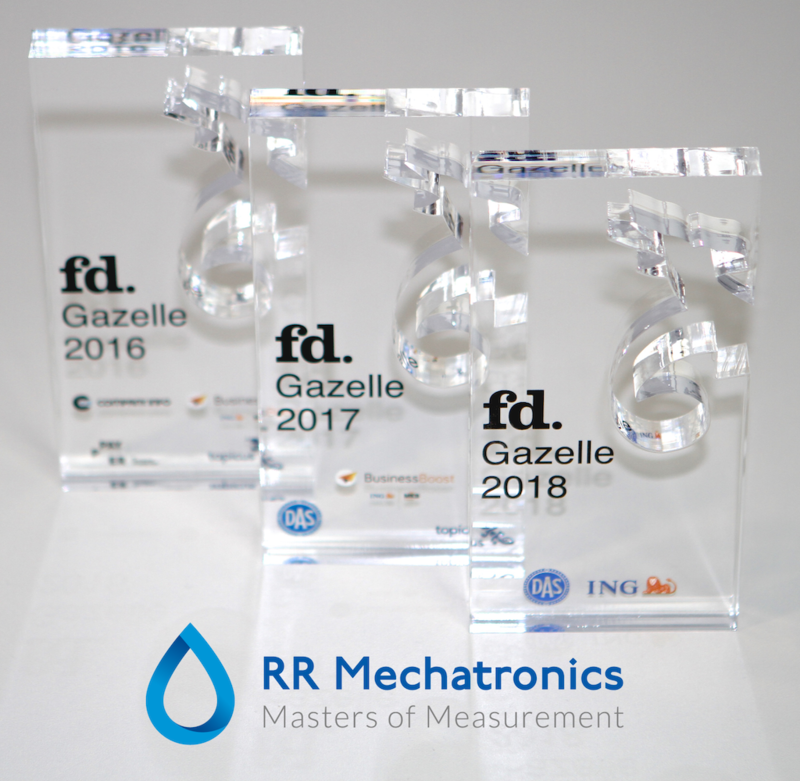 All of us at RR Mechatronics are grateful and proud that, now for three years on a row, we have been awarded a FD Gazelle for fast growing companies in the Netherlands. To be awarded a FD Gazelle once was an honor in 2016, it was a wow-feeling again in 2017, but the 2018 award definitely tells us we are on the right path with our beautiful, hardworking team of people that are Masters of Measurement. We share our thanks with our exclusive distributors worldwide that truly are our indispensable partners to provide the best blood sedimentation instrument solutions to our customers, the laboratories, and our scientific- hospital- and pharma- laboratory customers that use the Lorrca for red blood cell analyzes. RR Mechatronics, a dedicated high-tech medical technology company. We believe that every patient deserves the right diagnosis. December 17th. 2018 Investors of the NPEX stock exchange have recorded record time on all available bonds issued by RR Mechatronics, the medical technology specialist in the development of instruments for blood diagnostics for hospitals, laboratories and pharmaceutical companies. In a very short time, the issuance of NPEX bonds with an interest rate of 8% brought in € 3.5 million. The proceeds will be used by RR Mechatronics, which is based in Zwaag, to realize the deployed growth strategy in the coming years. Demand for diagnostic blood measuring and analyzing equipment is expected to increase significantly in the coming years. Thanks to the guidelines of the ICSH (International Council for Standardization in Haematology), the company from Zwaag holds the 'golden standard' when it comes to measuring blood sedimentation in the series of Starrsed instruments. All over the world, these instruments are used in large and small laboratories of, among others, hospitals for the measurement of blood sedimentation. In addition, RR Mechatronics has built up a leading position in the necessary measurement and monitoring of the blood of people suffering from Sickle cell disease using the Lorrca. According to Mark van Etten of NPEX, the full placement of the RR Mechatronics bond loan is another proof that Dutch companies can attract successful growth financing thanks to NPEX. "In total, 36 Dutch growth companies have raised more than € 75 million through NPEX in recent years," says Van Etten. Obligatielening RR Mechatronics (€3,5 miljoen) in recordtijd volgeboekt Beleggers van de NPEX-effectenbeurs hebben in recordtijd ingetekend op alle beschikbare obligaties die zijn uitgeven door RR Mechatronics, de medisch-technologisch specialist in ontwikkeling van instrumenten voor bloeddiagnostiek voor ziekenhuizen, laboratoria en farmaceutische bedrijven. In zeer korte tijd bracht de uitgifte van de NPEX-obligaties met een rente van 8% €3,5 miljoen op. De opbrengst wordt door RR Mechatronics, dat gevestigd is in Zwaag, gebruikt om de ingezette groeistrategie de komende jaren te realiseren. De vraag naar diagnostische meet- en analyseapparatuur van bloed zal naar verwachting de komende jaren sterk toenemen. 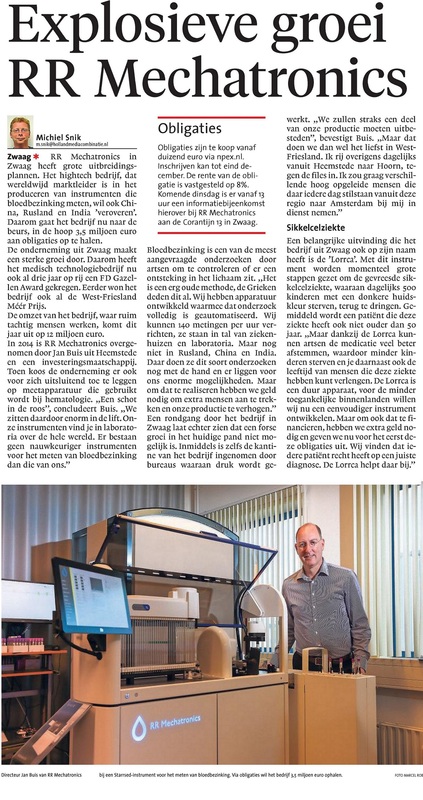 Dankzij de richtlijnen van de ICSH (International Council for Standardization in Haematology) heeft de onderneming uit Zwaag de ‘gouden standaard’ in handen als het gaat om meten van bloedbezinking in de serie van Starrsed instrumenten. Over de gehele wereld worden deze instrumenten gebruikt in grote en kleine laboratoria van onder meer ziekenhuizen voor de meting van bloedbezinking. Bovendien heeft RR Mechatronics een vooraanstaande positie opgebouwd bij de noodzakelijke meting en monitoring van het bloed van mensen die lijden aan de Sikkelcelziekte met behulp van de Lorrca. Volgens Mark van Etten van NPEX is de volledige plaatsing van de obligatielening van RR Mechatronics opnieuw een bewijs dat Nederlandse bedrijven dankzij NPEX succesvol groeifinanciering kunnen aantrekken. ,,In totaal hebben 36 Nederlandse groeibedrijven de afgelopen jaren meer dan €75 miljoen via NPEX opgehaald”, aldus Van Etten. All of us at RR Mechatronics are grateful and proud that, now for three years on a row, we have been awarded a FD Gazelle for fast growing companies in the Netherlands. To be awarded a FD Gazelle once was an honor in 2016, it was a wow-feeling again in 2017, but the 2018 award definitely tells us we are on the right path with our beautiful, hardworking team of people that are Masters of Measurement. We share our thanks with our exclusive distributors worldwide that truly are our indispensable partners to provide the best blood sedimentation instrument solutions to our customers, the laboratories, and our scientific- hospital- and pharma- laboratory customers that use the Lorrca for red blood cell analyzes. RR Mechatronics, a dedicated high-tech medical technology company. We believe that every patient deserves the right diagnosis.